A few days ago I had the pleasure to eat at Cafe Gratitude with a dear friend of mine. My friend drove there, and it was a little tricky to park because it’s street parking plus there are meters. Luckily we found a spot not too far from the restaurant and made our way across the street to Cafe Gratitude. I was insanely distracted once we got inside, I felt like a child in a candy store. I couldn’t stop touching things and thinking “OOO what’s that OOOOoo and THAT!” Cafe Gratitude has cute all organic hoodies and shirts for sale. As cute as they are the items are not affordable. There are also supplement powders and uncooking items for sale (also expensive compared to what I’ve seen in most shops). I think the sea palm was what really caught my eye and made me interested in getting the salad instead. 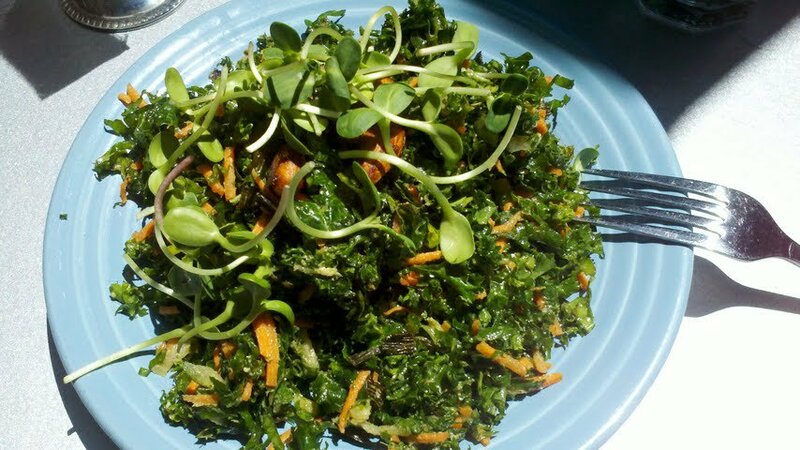 “I Am Giving” consists of: ginger-tahini dressing in a kale salad with sea palm, cucumbers, carrots, cilantro, and green onions topped with pea shoots and teriyaki almonds. This salad was expensive, huge, filling, tasty and very close to being worth the $13.75 I spent on it. The dressing was nice and thick, not heavy and went splendid with all the different vegetables and herbs. The flavors were fresh, warm, crunchy and smooth. I did not find the kale to be too crunchy, it was a little tender so I am guessing the kale was massaged with the dressing. I felt like there was a terrific balance in flavors, cilantro and green onions can be tricky to work with when one is using light vegetables like cucumbers and kale. But I didn’t find them overpowering in taste, texture, or flavor. There were probably five or so pieces of dehydrated teriyaki whole almonds on the top of my salad and the amount was just right. The almonds had a nice contrast in color and saltiness. Two thumbs up! I was insanely full after consuming this, and had no choice but to take my time anyway. That’s the beauty of kale salads, they help you eat at a calm rate and force you to actually really chew your food before swallowing. I also had a cup of their Be Love Farm kombucha, “I Am Bright” on their menu, which was $4. The kombucha was in a small mason jar, and was probably up there with some of the best kombuchas I’ve had but for the amount of kombucha in my glass I felt a little ripped off. For dessert we each had a chocolate maca ball that had just enough almond butter to bind it. When we placed our order the server stressed that these were a bit bitter, something I expected when raw cacao and maca. This dessert was super rich & was slightly bitter even for me! The almond butter flavor was a little stronger than I had imagined since it was used just for the sake of binding everything. This treat was also pricey, I think it was around $4. There is no printed dessert menu, it looks like there are just daily offerings. All of the desserts looked amazing, and original. I saw some sort of raw tiramisu, lime cake and even peach! It was a devilish case for sure right where you place your order and wait to be seated. The service at Cafe Gratitude is fantastic. My friend and I enjoyed the outdoor sitting except the tables are so close together that for once in my life I felt like I was too fat to sit somewhere. Just in case you were wondering my answer was stress. Cafe Gratitude is casual, hip, fun, tasty, fresh, and has a little something for everyone on their menu. The menu is not completely raw, they have split the menu between soups & salads, raw specialties, cooked specialties, breakfasts, sides, beverages, tea & coffee and beer & wine. If I go there again I hope to have more money with me and try the “I Am Terrific” Kelp Noodle Pad Thai dish! The restaurant I went to in Berkeley is on 1730 Shattuck Ave (@ Virginia) and they are open from 10 am to 10 pm. I heard this location will be closing, the others in the Bay Area have already closed up. So please call first if you are interested in going here, (510) 725-4418. You can check out a slightly condensed version of my review on Yelp!